Wear your art with Karen Mabon's dreamy scene of moths flying toward golden light. Moths open and close their wings, straining toward golden light. Karen Mabon's design is equal parts poetry and wearable art. All of her illustrations have this quality to them: a page plucked from a picture book for adults. Wrap the 100% silk scene around your neck and notice how it's so airy, it almost feels like flying. 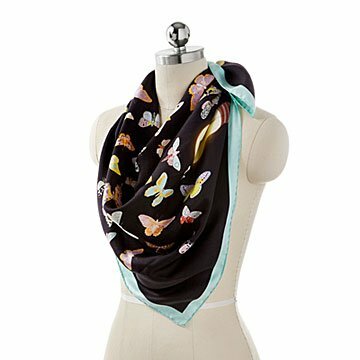 A great gift for artsy friends, the scarf is designed in England and made in Italy of pure Italian silk.